We are delighted to announce that a new Region in Sri Lanka has been formed. 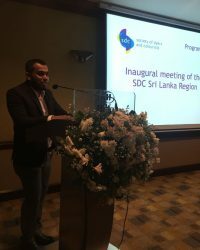 At the inaugural meeting on 4/4/18 at the Hilton Colombo Residences, the following Honorary Officers were elected: Randika Hennadige as Chair, Isuru Punchihewa as Vice-chair and Samangi Rodrigo as Honorary Secretary. We wish them every success as they begin this exciting journey!